Eternal youth is a miracle bestowed on only a small number of cars, and the Mercedes-Benz 300 SL coupe is one of this elite group. The Stuttgart-based brand unveiled its new sports car in February 1954 at the International Motor Sports Show in New York, and in so doing lit the fuse for an icon of the automotive world. With its flat, graceful body, the 300 SL had lost nothing of its freshness even as the millennium drew to a close and was voted “Sports car of the Century” in 1999. “Gullwing” doors provided that essential touch of inspiration, opening up towards the sky to reveal a tightly sculptured interior. 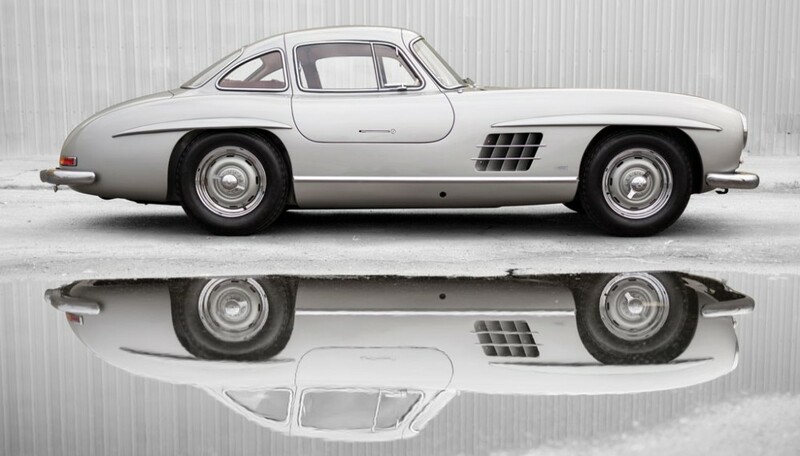 The history of the 300 SL is inextricably linked with the life of an influential admirer. American importer Maximilian E. Hoffman it was who urged Mercedes-Benz to build a road car in the image of its racing coupe, the start of production in 1954 providing a sweet fruit for his endeavors. The assembly lines may have waved goodbye to the last of the only 1,400 units of the 300 SL coupe ever made in 1957, but the spirit of this extraordinary car most certainly lives on. The Mercedes-Benz 300 SL was conceived initially as a purpose-built racing sports car (W 194). In 1952, the coupe notched up an impressive record of success in the year’s major races. At the Grand Prix in Bern the 300 SL sealed a clean sweep of the podium places, an awesome performance backed up by a one-two finish ahead of a stunned field in the 24 Hours of Le Mans. The Nürburgring duly yielded another one-two-three, and the new Mercedes racing sports car also claimed victory in the Carrera Panamericana in Mexico. It all added up to a majestic return to motor sport for Mercedes-Benz, picking up where the brand had left off during a highly successful period before the Second World War. Although there were initially no plans to send the 300 SL into series production, the Daimler-Benz Board had been left with the words of Maximilian (“Maxi”) Hoffman ringing in their ears. The official importer of Mercedes-Benz cars into America campaigned tirelessly for a sports car to offer his well-heeled clientele, and the 300 SL racer fitted the bill perfectly. After lengthy deliberations, the green light was given for series production of the road-trim 300 SL (W 198), as well as a smaller, open-top sports car, the 190 SL (W 121). The two models were due to celebrate their premieres less than six months after the Board had granted the project their approval. The occasion was the International Motor Sports Show taking place in New York from February 6 –14, 1954 and at the time America’s most important auto show. The engineers rose to the challenge of their race against the clock, and the 300 SL and its smaller brother, the 190 SL, were ready to receive the acclaim of the admiring crowds. Series production began in Sindelfingen in August 1954 and the price was fixed at 29,000 Marks – a quite enormous sum at the time, especially when you compared the new model alongside the Mercedes-Benz 170 Vb – on sale at 7,900 Marks. The body of the 300 SL was developed with the primary aim of cutting aerodynamic drag to a minimum. The result was a streamlined form with few adornments, a car which adhered faithfully to its design brief and which has retained its freshness and allure to the present day. Wonderfully proportioned and extremely dynamic, it was as if the 300 SL – surging forward on its wheels – had been cut form a single mold. The new sports car was a real crowd-puller, thanks in no small measure to its wonderfully charismatic “gullwing” doors. Rather than serving merely as a stylistic gimmick, they represented the central element of the 300 SL design, the ultimate example of necessity as the mother of invention. The car’s aluminum skin was stretched over a tubular frame, which – in the interests of stability – rose much further than usual up the sides of the vehicle, making it impossible to fit conventional doors. The response of the engineers was to devise an upwards-opening door concept. The elegance of the car’s side view remained undisturbed by a door handle, with a discreet pull-out bar disengaging the lock. The door then opened upwards with the help of a telescopic spring. The tubular frame for the 300 SL, designed by Rudolf Uhlenhaut, reduced weight to a minimum but provided maximum strength. A series of extremely thin tubes were welded together into triangles to produce a frame which boasted impressive torsional stiffness and was only subjected to compression and tensile forces. In the standard SL the frame tipped the scales at only 82 kilograms, whilst the complete car in ready-to-drive condition and including the spare wheel, tools and fuel weighed in at 1,295 kilograms. The body of the 300 SL was constructed largely out of high-grade sheet steel, although aluminum was used for the engine hood, trunk lid and the skin panels for the door sills and doors. For a relatively small extra charge, customers could choose to have the whole body made from light alloy, which cut 80 kilograms off the car’s total weight. However, only 29 SL customers took up this option and today their cars are highly sought-after rarities. The technical make-up of the 300 SL owes much to the Mercedes-Benz 300 (W 186 II) sedan, the vehicle of choice for many statesmen and industrialists and also known as the “Adenauer Mercedes”. The six-cylinder engine featured a number of modifications, one of which saw the carburetor replaced by a direction injection system – a technical advance which was years ahead of its time. This new technology boosted output to 158 kW (215 hp) and the car’s maximum speed up as far as 260 km/h, depending on the rear axle ratio. Customers could order their SL with a choice of five different ratios. The standard 1:3.64 variant was set up primarily to deliver rapid acceleration and capable of 235 km/h. The 1:3.89 and 1:4.11 ratios were good for even faster acceleration, whilst the 1:3.42 option offered a higher top speed. This figure rose still further – to 260 km/h – when the ratio was set at 1:3.25. However, this “resulted in greatly reduced acceleration, making the car less enjoyable to drive in downtown city traffic,” as the sales information pointed out. The 300 SL hit 100 km/h in just 10 seconds, with car testers at the time measuring fuel consumption at an average of 15 liters per 100 km. A 100-liter fuel tank was positioned at the rear of the car and could be enlarged to 130 liters at an extra charge. The engine had to be tilted 45 degrees to the left in order to squeeze under the hood of what was an extremely flat car, thus reducing the amount of space in the passenger-side footwell. The SL’s center of gravity was almost exactly in the middle of the car, laying the perfect foundations for fast and precise cornering. The chassis was essentially the same as the 300a sedan’s, but with sportier tuning, and the drum brakes were adapted in response to the increased performance of the muscle-bound sports car. Only later, in the 1961 roadster variant, were these replaced by disc brakes all round. The interior of the 300 SL was more solid than spectacular. The standard fabric seat upholstery was available in a choice of three checked patterns, but most customers opted for leather instead. The body paintwork came in silver metallic as standard, although red, dark blue and black also proved popular. A shortage of space made getting into the 300 SL something of a challenge – this was, after all, a sports car. Fortunately, the steering wheel could be folded down, allowing the driver to twist his or her legs in the direction of the pedals. Once seated, the driver enjoyed an ergonomically impressively refined cockpit design. The steering wheel was just the right distance for the arms to reach and the driver’s feet moved intuitively onto the pedals: the 300 SL was very much a driver’s car. In addition, the instrument panel was extremely tidy and clearly laid-out, with the rev counter and speedometer in the center of the driver’s field of vision, as you would expect. Out on the road, you quickly realized why the 300 SL had been christened with those particular letters – the car was certainly Sporty and Light. With an engine delivering 215 hp and a total weight of only around 1,300 kilograms, acceleration was suitably impressive – especially with the right choice of rear axle ratio. Exceptional torque ensured good pulling power at any speed. The steering was direct and the suspension made sure that the car hugged the road nicely. There’s no doubt that the 300 SL was a sports car of the finest pedigree. That said, it was far from impractical, as many owners were quick to appreciate. For them, this was a high-speed touring car which offered precise driving characteristics but which avoided sapping the energy of the driver unduly. The trunk was sufficiently large, complemented as it was by the extra room behind the seats for additional baggage. Plus, customers could order a made-to-measure luggage set designed to make the most of the space available. The first units of the 300 SL were sold in Europe in 1954, whilst Maxi Hoffman received his first customer car in March 1955. A total of 1,400 Gullwings rolled off the production line, the lion’s share of which – some 1,100 units – found their way to the USA. Hoffman had thus assessed the response of the market to the car extremely well and had every right to be satisfied with his work. However, he had also succeeded in stoking the expectations of his discerning customers, who now wanted a touch more comfort in their cars, a larger trunk and, in many cases, a cabriolet version. Hoffman passed the message on to Stuttgart and once again his request bore fruit – this time in the form of the 300 SL roadster (W 198 II) unveiled in 1957. The racing genes of the 300 SL tempted renowned racing drivers and privateers from all over the world to enter sports car races and rallies. The 300 SL made its first appearances in the popular racing events of the time in 1955 – and didn’t have to wait long before tasting success. The Mercedes-Benz 300 SL attained legendary status well before the assembly lines ground to a halt, thanks in part to its success in race competition but most of all to the captivating allure of its stunning design. The 300 SL has been counted among the world’s most sought-after and highly rated cars for 50 years now, and its status as one of the most revered classic automobiles on the market is set to remain intact for quite some time to come.